This past weekend me and the FI went to the National Bride Show downtown. It was a bit of letdown (I got it mixed up with the BIG bridal show that happens at the MTCC) but some good inspiration definitely came out of it. I might have squealed rather loudly and feverently asked my dude if we could do that for engagement photos. Of course, I knew what his reaction would be, big-time no! But I'm not the giving up type. "I want to do photos where I'm force-choking you!" "How about photos where I have Princess Leia buns?" I laughed and gave up after that. He likes his science fiction and fantasy as much as I do, but to him a wedding = classy, not off the wall. The next day, I was over at his house with his family. His sister makes cakes as a hobby and I always knew she'd make one for our wedding, so we hopped on Pinterest looking for inspiration. First we looked at classic wedding cakes, then Indian-inspired wedding cakes, then she decided that since the cake at our destination wedding was the "real" wedding cake, she would be making a "fun" cake for our at home reception. She thought to herself "hmm, what do my brother and mysticjade both like... GAME OF THRONES!" and she immediately found a blood-spattered cake with the Iron Throne at the top that we cracked up over. Of course we immediately showed it to my FI, got the classic reaction: no thanks. 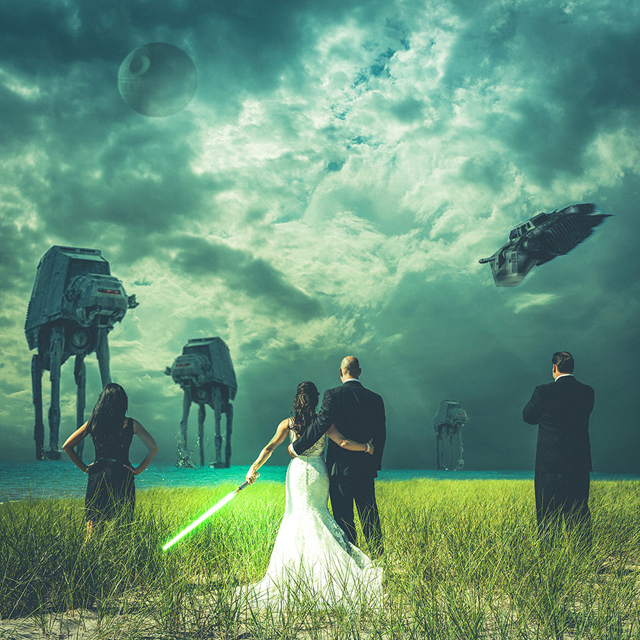 Is it normal for the bride to out-geek the groom? If it's wrong, I don't want to be right.